Steve Hodel cannot let go. 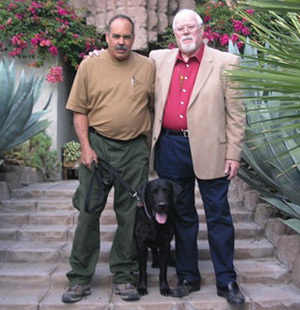 And so he returned to a distinctive Hollywood mansion with another ex-cop, Paul Dostie, and Dostie's search dog, Buster. Hodel had a mission for them. In his book "Black Dahlia Avenger," the retired LAPD detective and best-selling author convinced many skeptics that he had solved the gruesome 1947 murder that became LA's perhaps most notorious cold case. 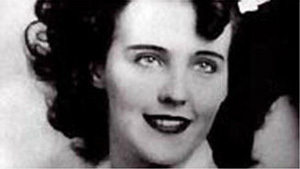 The body of Elizabeth Short, 22, had been severed in two with surgical skill and technique, leading investigators to conclude early on that the killer likely had medical school training. That killer, Steve Hodel ultimately concluded, was his late father, George Hodel, MD. What's more, because there was no trace of blood in the empty Leimert Park lot where the remains were found, detectives realized she must have been killed elsewhere. That elsewhere, Hodel concluded, was the landmark Hollywood mansion where Dr. Hodel made his home, the distinctive "Sowden House" designed on a Mayan theme by famed second-generation architect Lloyd Wright. Steve Hodel lived there as a child. As he looked into the case, he was able to determine from records that he and his siblings were away with their mother at the time of the Black Dahlia murder. 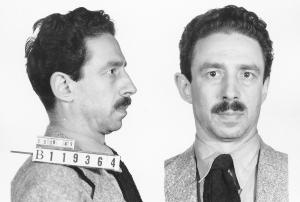 Hodel marshaled considerable evidence, which was later corroborated after "Black Dahlia Avenger" was published, when the District Attorney Steve Cooley agreed to reopen decades-old case files. Right at the top was a picture of Dr. Hodel; it turns out he had been the principal suspect. Investigators had even planted a bug in the house to listen for incriminating admissions. But before authorities brought charges, Dr. Hodel abruptly abandoned his family and relocated to Asia. The likes of Steve Kay, then a head Deputy DA, concluded that Steve Hodel had made the case against his father. But that wasn't good enough for Steve Hodel, who has continued seeking more evidence in hopes of convincing his former employer, the LAPD, to declare the case officially solved. So when the opportunity arose to return to the Sowden house with Dostie and Buster, Hodel took it. The arrangements with the current ownership had been made by producers of a segment for the "Ghost Hunters" program on the SyFy Channel. Hodel knew that the sounds of blows and a woman's screams had been heard coming from the basement, according to the transcript of what police heard through the bug. The basement had never been finished and when Hodel, Dostie and the SyFy crew went there last November, the floor was still dirt. With his keen sense of smell, Buster alerted in four locations, indicating he had picked up the scent of human decomposition, faint traces of which can remain for decades, Dostie said. But is it corroboration? Dostie cannot say for sure. The decomposition of human tissue that Buster detected did not necessarily originate in the basement. With the house on a slope, it is possible traces may have migrated downslope from the hillside lot above. Labwork may be able to pin down the possibilities. Hodel is waiting for the results. Dostie and Buster have moved on to other searches, Buster hardly losing a step despite the fact that the black lab was diagnosed with a rare form of cancer in a hind leg, which had to be amputated. Thank you Stacey for staying up late to get this! I remember seeing Hodel several years ago on a talk show, presenting his evidence that his father was the Black Dahlia killer. He presented a photo album of his father's with pictures of the Black Dahlia. But to me, these pictures looked nothing at all like Elizabeth Short. I think someone once said to him that the woman in the pictures did not even resemble Miss Short, but Hodel just ignored the comment. I think I saw the pic he was showing saying it was her, and on some show I watched, possible 20/20 or something like that, he took it to a expert of photography who concluded it was not Elizabeth Short in the picture. Given enough time, someone will eventually try to pin this one on Bruce or Charlie. i think kay's been made a fool of by this guy.